The truth is, for the most part, I enjoyed “Emancipation.” The weird thing is that it felt like two separate shows: the first half almost resembled a clip episode (I’m thinking of the seasonal Stargate: SG1 filler episodes), focusing on what’s happened so far, but without the clips; while the second half was engaging and moved the plot forward in some unexpected ways. Let’s start with the first half, which focuses on Coulson (Clark Gregg) giving General Talbot (Adrian Pasdar) a tour of the S.H.I.E.L.D. base, and trying to convince him that the Inhumans on their side do not need to be registered with the government (the newly sanctioned Sokovia Accords from Captain America). 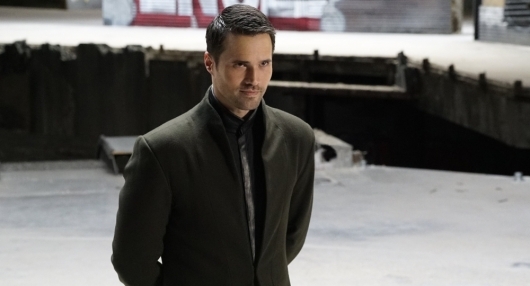 This section also serves the purpose of reminding us about everything that has been going on recently with Hive (Brett Dalton) and Daisy (Chloe Bennet) by relaying all of the information to Talbot. This was the most frustrating part of the episode because it once again felt like the writers had nothing new to say, and it was almost an insult to the viewers’ intelligence. What, us laymen don’t have the capability to remember plot points from seven days prior? Talbot meets YoYo (Natalia Cordova-Buckley), who’s paying a visit to the base and looks to actually be a part of the team now (which I’m happy about, because she actually seems to have a bit of depth to her character). In somewhat of a brilliant moment, as she’s leaving the scene, she shows Talbot what she can do by stealing one of the badges (having run so fast that even we didn’t notice her move) from his uniform. “I’m waiting,” Talbot says with a tad bit of annoyance to his voice, as YoYo smugly lifts up his badge in the air and then returns it to him. Next, the General interacts with Lincoln (Luke Mitchell), who is still locked up for being, as May puts it, too “obsessed” with Daisy and causing more trouble than necessary since her absence. Somehow Coulson thinks that having him speak with one of their own Inhuman team members who is essentially a prisoner for disobeying orders will help matters. I’m not sure about the logic here, but it’s not the only time Coulson does so. The third Inhuman introduced to Talbot is Lash, who is also being held under high guard. Talbot’s main reaction toward seeing such a monstrous creature is exactly what you’d expect from him: he wants him dead. And this ends the first half of the episode. The second half actually picks up, as Daisy — who’s looking extremely ill due to giving up her Kree blood to assist with Hive’s agenda (more on that later) — hacks in into the S.H.I.E.L.D. base and tries to break out Lincoln. Even after Fitz (Iain de Caestecker) locks her out of most of the base, he’s unable to stop her from remotely hijacking the quinjet. All Lincoln needs to do — which he does — is get past Mack (Henry Simmons) by electrocuting him. Poor Mack just can’t stop being brutally injured by his friends. Lincoln gets on the quinjet and leaves for Hive’s base. But wait! It isn’t Lincoln on the quinjet! Say what? That’s right — May (Ming-Na Wen), Lincoln and Coulson came up with an elaborate plan (to convince Talbot? I’m not entirely sure) to have Lash switch with Lincoln on the jet and to be the one sent to Hive. Why? Because Coulson believes that Lash was created to kill Hive. The scene is actually pretty cool, with Lash basically besting Hive in a fight and throwing the Watchdogs — who’ve been turned into rabid, mindless, Inhuman pets — all around the room before killing them all. Daisy even comes out to fight but is so spent from giving blood that she can barely stand up. Lash, able to take Inhuman abilities from said Inhumans, kneels down and takes the Hive parasite out of her, stating, “You’re free.” Placing her in the quinjet, he’s about to get in himself, but James (Axel Whitehead) comes out of nowhere and kills him with his Ghost Rider-like-fire chain. NO! Lash! NO! Daisy returns to S.H.I.E.L.D. with a large welcoming party (save May and Mack), but she’s in cuffs and is escorted to sickbay. So, yes, the first half was fairly boring, but in hindsight, the setup actually paid off in what turned out to be an exciting and unexpected episode. Many questions now arise leading into next week’s two hour finale: which agent will die? Will Daisy be able to overcome her physical and, most likely, mental wounds in time to help her friends in what is surely to become an all out Inhuman war? Will her friends be able to trust her in such a short amount of time? Will Mack be beat up by any more of his team members? Will Hive continue to embrace the Matrix? Only one week until all of these questions will hopefully be answered! – Mack and YoYo have great chemistry. I mean, I hope they keep her on the show because watching the two of them on screen together is almost as good (but not quite) as watching Fitz-Simmons. The two have a conversation about fighting evil while Mack is still recovering from last week’s injuries at the hands of Daisy. He’s not so sure that it’s worth it. But YoYo tells him a well-known saying from back home in Columbia: “Evil preys on the weak because it is afraid of the strong.” Mack has a lot to think about, especially when she comes back to him at the end of the episode and tells him to be strong and to fight, handing him her cross necklace. – The cross necklace that YoYo gives to Mack is one of the objects floating around in the exploding space shuttle — the same shuttle that holds, whom we believe to be, the agent who will perish in the season finale. Mack? Say it ain’t so! – Hive wanted to take all of Daisy’s blood. It’s a good thing Lash saved her! – We also learn what Hive wants the blood for: to attach to a fully operational warhead stolen from the ATCU — one that the agents believe he intends to explode into the atmosphere, causing the same rabid-Inhuman gene that the Watchdogs were infused with to be spread all over the world. – I still think it’s dumb that they’ve been advertising a death.